This morning, I cooked up our first "yard fresh eggs" (doesn't sound as good as "farm fresh" but it's technically correct). As you can see by the photo at right, I made them over-medium just to be able to watch them cook up on their stiff whites and to get that golden ooze of a fresh yolk. The biggest surprise in cooking them? The egg shells are so hard! Over the years, I've learned (by rote) how to open an egg with one hand, using just the right amount of force to crack the shell so I can spill out the contents. I'm going to have to re-learn the skill with these fresh eggs now. And I gotta tell ya, it's going to be hard to eat the store-bought eggs after this morning's exercise. 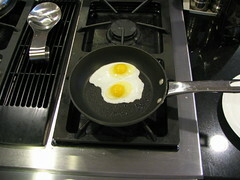 Sure, I'll be able to put store-bought eggs in batters and such, but eating eggs in isolation? (omelets or scrambles or over-mediums?) It'll have to be yard fresh eggs for me, thanks. If you click on the picture of the eggs in the pan, you'll get to the rest of my Flickr stream showing Sophia's first three eggs in a bowl, and the aforementioned golden yolk ooze. YUM! Can I taste one before I take off for Germany :) ??? Congratulations! Nothing like those first few eggs to make you glad you took in some chooks, huh? Where in RWC are you? I am in Pacifica...how many hens do you have? Do you have an Eglu? I've got 2.. they are great! What types of hens do you have? I've got redstars, silkies, and aracauna. They are great! Lyn, glad to hear you're a local chicken farmer, too! We're up near John Gill Elementary School in RWC, and we love our orange Eglu. I'd thought of getting a couple silkies, but am glad we got our Barred Rocks, Sophia and ZsuZsu. Welcome to the blog!